– NB Last week when I began writing this post, the names of Peter Leithart and John Armstrong appeared on the Adjunct Faculty page of Knox Theological Seminary. Since that time, perhaps in response to public outcry, these names have been scrubbed from the Knox website. It seems that erratic administrative behavior is one of the few constants at Knox. For during the 2007 controversy involving Warren Gage, the school was treated to the absurd spectacle of the firing/suspending/and rehiring of Dr. Gage in a whirlwind of activity that was nearly impossible to follow. In another context the Keystone Kops routine might have been funny. But there was nothing funny about what happened at Knox. For a seminary died, and the institution doing business under the same name is a grotesque parody of Dr. Kennedy’s dream of a new Princeton Seminary in south Florida. Given Knox’s spastic history, I have decided to publish this post under the assumption that Leithart and Armstrong will be teaching at the school. I could be wrong, but even if I am, Knox has tipped it hand regarding its vision for the future. And that vision is Federal. Stephen Welch did us all a favor with his article Knox Theological Seminary: A New Haven for Federal Visionists. As a former KTS student, I’m thankful that there are discerning graduates of the school who care about the truth and are willing to state their objections to the ongoing disaster that is Knox Seminary. But the article wasn’t the end of it. Wes White posted it on his Johannes Weslianus blog, and this resulted in a number of interesting comments. One in particular stood out. Lauren wrote. I think the FV got their foot in the door of Knox when they held the colloquium in 2004. Remember, Jesus tells us to beware of the “yeast” of the Pharisees. Paul in Galatians gives a strong warning against those who would preach another gospel. Inviting false teachers to the table and giving them a venue to spew their poison is a recipe for disaster. I don’t think it’s accurate to say that the colloquium was the FV’s first step into Knox–other than that it was there that Gage and Leithart met [this is a reference to Warren Gage, current Dean of Faculty at KTS and Peter Leithart, noted Federal Visionist and new KTS employee]. Rather, the colloquium was where FV proponents really got called out, had to let their true colors fly, and the resulting book has provided many scholars with some of the most important primary data as to what the FVers say, as well as what some of their toughest critics were saying at that early stage. Last week Stephen Welch blogged a post titled Knox Theological Seminary: A New Haven for Federal Visionists. If you haven’t already done so, check it out. It’s a good post. The article, which also appeared here on The Aquila Report site, breaks the news that Knox Theological Seminary (KTS) has hired Federal Visionists John Armstrong and Peter Leithart. This is certainly big news. But to some pre-2007 KTS students , it’s not especially surprising. Since some Federal Vision (and some NPP) advocates appear to endorse Dr. Gage and his hermeneutic (for instance, Peter Leithart) – since Dr. Gage’s hermeneutic does provide an exegetical basis for their theology – then will the Federal Visionists see this as an opportunity to move into Knox Seminary and establish a Federal Visionist and New Perspective on Paul institution and ministry? Good call, Jason. That’s insight. 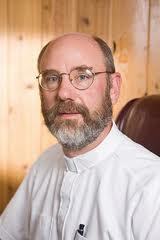 Now what do you think about the odds of NT Wright being the next Knox guest of honor? For my part, I imagine they’re pretty good. If nothing else, the weather in Ft. Lauderdale’s got to be better than in St. Andrews. The predicted chickens have finally come home to roost. And while there’s some satisfaction in being ahead of the curve regarding the doctrinal direction of KTS, that satisfaction is more than offset by the knowledge that the transformation of Knox into a Federal Vision school is no longer a future event, but a present reality. All this raises an interesting question, now that KTS has gone FV, whither Coral Ridge? It’s separated from Knox by no more than the breadth of N. Federal (Vision) Highway and wide open to an FV takover…if that hasn’t happened already. May the Lord defend the truth of his Gospel. Today I received the plenary session recordings I had ordered from the recently concluded ETS conference. These are the sessions in which NT Wright defended and Thomas Schreiner and Frank Thielman attacked the NPP. Lord willing, I plan to listen to and comment on these sessions over the next several weeks. I’d like to say I’m looking forward to hearing Schreiner and Thielman take on Wright, but from the comments I’ve seen from around the internet, I don’t hold out a lot of hope the Schreiner and Theilman gave Wright the good old fashioned smack down he deserved. What NT Wright really says amounts to a direct assault on the Gospel of Jesus Christ, for Paul tells us that, “Christ died for our sins according to the Scriptures.” And, among other things, according to the Scriptures means Christ’s righteousness is imputed to those who call on his name. Wright may find this a baffling “category mistake” or, as he says elsewhere, “a cold piece of business, almost a trick of thought performed by a God who is logical and correct but hardly one we would want to worship” (Wright like many contemporary heretics hates logic as much as he hates God), but while imputation leaves a bad taste in his mouth, it’s the way God justifies sinners, for as Isaiah writes, “by His stripes we are healed.” And that, Dr. Wright, is imputation, no matter how much you denigrate, dispute, downplay, deny or otherwise despise it. Like a lot of kids growing up in the 70s and 80s, I was a huge comic book fan. I had a subscription to Spiderman for several years – yes, just like Peter Parker I was a bit of a nerd – and did more than my fair share to help pay the local bookstore’s rent by constantly raiding their collection of overpriced back issues, all wrapped in special comic book protective covers. Those wrappers were very important. They added gravitas to the comic books, transforming them – in my mind – from kids stuff to real, serious collectors items. As far as I know, I still have most of them too. That is, unless mom threw them out…hmm, maybe I’d better go check on that first. 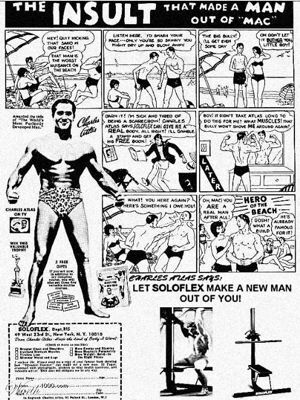 At any rate, though I can’t recall much in the way of detail about the stories I read, one thing I do clearly recall from those comic books was an ad run by Charles Atlas. The famous one we’ve all seen. You know, where the beach bully kicks sand in the face of the 98 pound weakling and steals his girlfriend. Determined not to let it end like that, the wimpy kid goes and orders a Charles Atlas book, bulks up and in the end gives the bully a good thrashing. He gets his girlfriend back too. Not a bad return on a ten-cent stamp. Now growing up in Cincinnati, I didn’t have a lot of opportunity to go to the beach, so I can’t say that I ever had a bully kick sand in my face. But of course bullies aren’t found only on the beach. They’re on playgrounds and at the office too. Some bullies teach in seminary and preach from the pulpit on Sundays. I wrote to the church, but Diotrephes, who loves to have the preeminence among them, does not receive us. Therefore, if I come, I will call to mind his deeds which he does, prating against us with malicious words. And not content with that, he himself does not receive the brethren, and forbids those who wish to, putting them out of the church (3 John 9-10). A few years ago, I had a personal encounter with a theological bully named Warren Gage. He was Professor of Old Testament at Knox Theological Seminary when I was a student at the school. For three hours every Monday morning I’d sit in his class and become physically ill listening to him attack the Reformed faith. The same faith I heard him swear to uphold at the start of the semester. He was kicking sand in the face of all of us: any student who came to Knox expecting to get Reformed seminary training, the school that hired him, and the people who donated to Knox thinking it was doctrinally sound. But unlike the skinny kid in the comic book ad, when Knox had the opportunity to confront the bully and defend Christianity, the school backed down and the bully won the fight. Today, Warren Gage still teaches at Knox Seminary and has added the title Dean of Faculty to his name. The Westminster Confession begins with a chapter on the doctrine of Scripture. And it does so for good reason: all other Christian doctrine depends on it. A sound view of Scripture will tend to produce sound doctrine in other areas. Likewise, a defective view of Scripture will tend toward heresy. The New Perspective on Paul theologians have a defective view of Scripture in at least two areas: they deny both the inerrancy and sufficiency of Scripture. When Wright says that he regards Ephesians, “as far more likely to by by him [Paul] than by an imitator, he is spaking the subtle language of unbelief, for the epistle begins, “Paul, an apostle of Jesus Christ by the will of God.” For a man with the correct view of Scripture, the authorship of Ephesians is not a question to be pondered, it is a truth to be believed. Wright also shows evidence of basic epistemological confusion. While the word epistemology can sound rather intimidating, the idea it expresses is fairly simple. Epistemology is the study of how we know what we know. The proper Christian position on epistemology states that we know what we know because God has revealed it to us in his word. All truth is graciously given by God in his word, and apart from his word man can know nothing. The statements of all scientists, philosophers, historians and theologians are to be tested against Scripture. If they do not agree with the Bible, they are false. The problem here is that Wright, along with his mentors Sanders and Davies, does not know what proves what. Wright erroneously believes that we use the Dead Sea Scrolls, the apocrypha and pseudepigrapha to interpret the Bible, when, in fact, it is the Bible that informs our understanding of these other documents. We do not use Second Temple Judaism to establish our understanding of the Bible, we use the Bible to establish our understanding of Second Temple Judaism. John Robbins made the point that when philosophical (and theological) systems go wrong, they tend to go wrong at the very beginning. 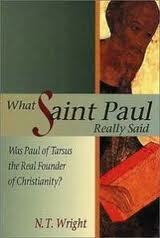 This is certainly the case with NT Wright and the other New Perspective on Paul writers. Their erroneous and unbiblical epistemology leads them to their erroneous and unbiblical doctrine of justification.